LeBron James is an extremely stylish guy. He can even make a tiny "man purse" look cool. But some jerseys are beyond redemption. Every team has made some questionable decisions with their uniform design over the years. Some are ill-advised throwbacks. Others are misguided new designs for the dreaded alternate jersey. And sometimes, you just make up a new uniform so fans will buy it, regardless of how ugly it might be. Though some people claim that you can't argue over taste, I beg to differ. I will argue precisely that in the following ranking of every team's worst jersey in history. I don't mind loud uniforms. I like pinstripes. I even like cartoon raptors that more closely resemble a Tyrannosaurus. But these jerseys—ranked from least awful to most awfully awful—are reprehensible, each more than the next. The Boston Celtics have perhaps the most classic and least-altered uniforms in all of pro basketball. After all, if they were good enough for Red Auerbach and Bill Russell, then they're good enough for Paul Pierce. But the C's inevitably fell prey to the league-wide trend of adding black to the uniform. "Get it on there somewhere! Piping, panels, numbers, letters. Anywhere!" There's really no need for this. Let the Cleveland Cavaliers play around with their color scheme. All Boston needs is green and white. On St. Patrick's Day 2009, the Boston Celtics played themselves. Wait. Apparently, the team wearing those green and black uniforms which look exactly like the Celtics' alternates are actually the Chicago Bulls. Okay, sure, it's Paddy's Day. You want to celebrate the holiday? Fine. But how can a team that has never had any green in its uniform just decide to completely alter their color scheme? And then look exactly like their opponent?! Perhaps they allowed the same guy that dyes the Chicago River green every March 17 to design these jerseys. Team officials have yet to respond to my query. Yes, these are the Los Angeles Lakers' throwback jerseys. And no, these were not created by the Dodgers for a charity basketball game. While these jerseys may have looked good on Elgin Baylor, they fly in the face of the style and success accrued by Kareem Abdul-Jabbar, Magic Johnson and Kobe Bryant. The purple and yellow looks great. Don't mess with it. That would be like changing the team name just because there are no lakes in Los Angeles. Can't we just blame these throwbacks on Jim Buss? The New York Knicks have a good color scheme that hasn't changed much over time. Blue and orange have long been the theme. The team introduced some black panels in the late '90s, and now they've returned to a classic look with the words "New York" less arched than they used to be. That's fine. But again, we have a St. Patrick's Day fashion massacre. Green and orange are not great complements. At least they don't wear this gaudy look very often. This team is...ummmm...okay, I give up. Who are they? I can only assume that, based on the players pictured, these are the Los Angeles Clippers. They must have gotten a bulk discount on the tiny letters, because they are practically illegible. And I think they got some irregular numbers to sew on as well, because the numerals look crooked on each jersey. Honestly, the Portland Trail Blazers have had the same uniforms for quite some time, and I think the lowercase version of "Blazers" is better than the all caps. The stomach stripe is a bit odd (is it a blazed trail? ), but they've been rocking it for a long time. In this case, the primary problem is the man inside the jersey. And his short shorts. In the 1984 draft, Houston selected Hakeem Olajuwon first overall. Portland selected Sam Bowie (pictured) with the second pick. And, of course, the third pick was Michael Jordan. Ouch. Charles Barkley and John Stockton were selected later in the draft, but Portland swung and missed in their search for a big man. The same fate befell them when they selected Greg Oden in 2007 ahead of Kevin Durant. Portland is still trying to replace Bill Walton in the middle. I can dig some bold looks. I happen to like the Houston Rockets jerseys with the vapor-trail pinstripes and cartoon rocket on it. But these are just too loud and gaudy. You can call them wine and gold if you want, but it looks more like off-brand ketchup and dried, crusty, picnic mustard. The Memphis Grizzlies are another misnomer. They do have grizzly bears in Vancouver. They do not have them in Tennessee. I'm not sure what this font is about, but it was state-of-the-art back in the late '80s. Maybe it's an Orion Pictures release. I have to admit that I liked the hideous uniforms they had during the dark days up in Vancouver. They were loud, proud and unapologetic. Plus they had a badass grizzly on it. But these Memphis jerseys are just boring. And ugly. I know, I know, you're wondering why this isn't the Milwaukee Bucks' green jerseys with the picture of a majestic buck on it. Well, I actually like those uniforms. Purple and black, on the other hand, don't exactly strike fear into the heart of opponents. It's fine for college. It's fine for the Colorado Rockies. And it works for the Baltimore Ravens. But these are just a little too purple for the hardwood. And lacking any panache. Keep it green, Milwaukee! Or you could just wear the Robin Yount era Brewers' throwbacks. Aside from the expanding pinstripes and the prima donna wearing the jersey in this picture, these don't actually look that bad. 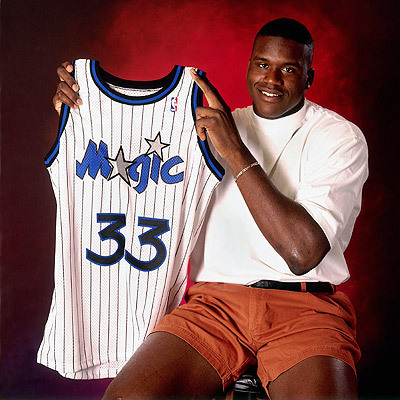 But the Orlando Magic still got it all wrong with these jerseys. What is that font? The letter "A" in Orlando is supposed to be a star. Or, better yet, it should read "Magic" with a star used for the "A" and the dot over the "I" like in the good old days. These? C'mon. You have to own your identity. If you play a genie sound when a free throw goes in, then run with it! These are not magical at all. I don't think we need to do too much analysis when questioning the decision-making skills of the New Orleans Hornets. This is an organization that has elected to change their nickname to the Pelicans. That sounds more like a Single-A baseball team. But they already missed the mark with these jerseys. As if these shades of blue and yellow weren't bad enough, they also boast pinstripes of varying colors that are too far apart and a strangely tapered black panel on the side. I look forward to the Pelicans' new logo. The Charlotte Bobcats have had their share of struggles. They were an expansion franchise in a city that couldn't support its previous basketball team (although plentiful blame can be heaped on George Shinn for the relocation of the Hornets). Then the Bobcats became the worst team in league history last season. While they have improved their play this season, they should probably bring in Tim Gunn to advise on their jerseys. What color are these exactly? Pewter? Blue-gray? It looks like someone washed Civil War uniforms from both sides in hot water. And the piping is just downright ugly. This is another case of "who are those guys?" Based on my search keywords, these are the Sacramento Kings. But how would you know? The lettering on these boring jerseys is essentially illegible. The Kings have cycled through a lot of jerseys over the years without much success in any of them. Aside from the days of Mitch Ritchmond, it's been tough times for the Kings. But soon, that will all be over when they move to Seattle (oops, did I spoil the surprise?). Okay, maybe they won't be moved, but their attendance is awful. Why wear these all-black uniforms when you can rock the powder blues like Reggie Theus? C'mon, Sacramento! I think we can all agree that the worst fashion misstep the San Antonio Spurs ever made was the "fiesta" colors of the mid-'90s. They never appeared on the jerseys, but they were on the warmups, team apparel and even in the paint down the lane of their home court. But specifically for their uniforms, the Spurs have kept it to a classic black and white scheme that still has more flair than the Brooklyn Nets' new kit. San Antonio practically hasn't changed their look since they were the Dallas Chaparrals in the ABA. But why introduce these boring, gray alternates with a single spur hanging amorphously around the sternum? They need to just bite the bullet and put actual spurs on the sneakers. The Phoenix Suns' best jerseys are without a doubt the ones with the large cartoon basketball as a sun on them. But these gray and orange jerseys are ugly. There's too much gray and not enough letters. Why is the airport code written across the chest? And why does the number have a halo around it? You would think that with all the time the Suns saved by not playing defense under Mike D'Antoni, they would have come up with something that looks better than these. The Minnesota Timberwolves apparently decided to use the lettering from a horror movie for these jerseys. But all they succeeded in doing was scaring Kevin Garnett out of town. This font appears to have been electrocuted by the typesetter. They even constructed a lining around the neck and arms that resembles a row of pine trees. That's charming, but also pretty lame. Can't we get a snarling wolf on these? The T-Wolves need something cool to keep Kevin Love and Ricky Rubio in town. The Golden State Warriors have had some sweet jerseys over the years. The royal blue and yellow with the map of California was awesome. The new uniforms with "The City" and the bridge on them are very cool. But then there's these, with lettering out of an animated movie for eight to10-year-olds. Perhaps the awfulness of this jersey is exacerbated by the fact that Latrell Sprewell is wearing it, but it seems like the designer just choked when he drew these up. The lightning bolt above the team name also harkens back to their old mascot, Thunder, who relocated to Oklahoma City and expanded into an entire basketball team. So the Miami Heat are not even attempting to equal the beauty of the jerseys they donned during the rough-and-tumble Alonzo Mourning days. The Heat now mainly sport some sort of plain, monochromatic uniform that makes them look like Spy vs. Spy. But at some point, someone decided that they needed to pay tribute to the Miami Floridians of the ABA. And the Floridians played in these gaudy pink and tangerine numbers. No wonder they only existed for two years in the late '60s. These might be okay if you were strolling down Miami Beach sipping a frozen drink from Wet Willie's, but they don't belong on a basketball court. The Utah Jazz had a great run with John Stockton and Karl Malone. They had some brilliant, rich purple jerseys that put the Bucks' purple unis to shame. The "J" in "Jazz" was a music note! But these mountain jerseys are terrible. Aside from not capturing the majesty of the Rocky Mountains, the illustration looks like a failed graphic design project. But what else do you expect from a franchise that didn't bother to change their name when they moved from New Orleans even though Utah is probably the least jazzy state in the union. Okay, the Indiana Pacers have these throwbacks, and they actually decided to wear them. It features an odd, meandering stripe ranging vertically over the jersey. Perhaps it's meant to simulate a racetrack from the Atari arcade game Super Sprint. These uniforms are one of the few weak points in the team's fashion history, as I actually liked the pinstripe jerseys sported by Reggie Miller and Rik Smits. I just despised that team. Ummm, yeah, I have no idea why the Denver Nuggets have these new jerseys. Apologies to Andre Iguodala. They're reminiscent of their sweet-looking rainbow jerseys from the early '90s, but the rainbow sunset over the Rockies has been replaced by a blinding, wide swath of yellow. Yes, the Philadelphia 76ers do play in the city that hosted both the First and Second Continental Congresses. But there's really no need to brag about it with this lame attempt at patriotic pride. A lapel pin would have sufficed. These red, white and blue stars could just as easily symbolize Slovenian independence. The Oklahoma City Thunder have only existed as their current incarnation since 2008, but they already have one of the ugliest jerseys ever. These new alternates are simply puzzling. They're...retro? I'm not sure what to make of the vertically printed "Thunder" in the banner down the side, but it almost looks like it could be a broken neon sign. These Atlanta Hawks jerseys are so bad, they're good. There's a snarling hawk grasping a ball in its talons. What more do you want? But it's pretty hard to beat the simple primary colors of the late '80s and early '90s. The bold departure pictured above fell on its face. The Toronto Raptors decided to kick the tires on these camouflage uniforms for Canadian Forces Night. Camouflage looks bad on the San Diego Padres, and it looks terrible on the Raptors. Someone should probably clue them in that jungle camo doesn't work in an arena with a hardwood floor. Still, as shown, Raptors players sometimes try to ambush opponents like soldiers of fortune. On October 28, 2003, the Dallas Mavericks unveiled a new alternate uniform. That was the only game in which they ever wore those jerseys. It didn't take long for fans and observers to register their displeasure with the bizarre, ombre-silver uniforms, which were quickly dubbed "trash bags." While I am slightly partial to the Cleveland Cavaliers' '90s logo of the ball going into the splintering net, the paint splash uniforms were prolifically terrible. At least we got a Shawn Kemp photo out of it. When they still played in New Jersey, the Brooklyn Nets once sported a strange, acid-wash jeans sort of look. It wasn't around very long, but these jerseys were both amazing and very ugly. It looks like someone decorated their child's room with cloudy sky wallpaper and had material left over. But respect to Drazen Petrovic (pictured). Yes, the Detroit Pistons chose to eschew their classic red and blue color scheme in favor of these hideous teal uniforms. And it goes beyond that, to the horrifying visage of a flaming horse head adorning the center of the jersey. It's also flanked by tail pipes that come out of each "S."
These are almost the worst jerseys in the history of the NBA. And based on the track record of his judgment, they were probably Isiah Thomas' idea. Alas, we have arrived at the coup de grace. These jerseys were clearly invented by some drug-addled individual in the employ of the Washington Wizards. They're gold and black with stars. It makes no sense. But neither does renaming your team the "Wizards." On the plus side, they don't wear these anymore. On the negative side, the Wiz are without John Wall and they look like the worst team in the league this season, so they might consider donning these old jerseys to complete the hopelessness. Follow me. I'm a highly unlikely fashion guru.